Google Alerts is a email update service from Google that emails the latest news and pages about a specific topic. Create Google Alerts in a few seconds to stay up to date on everything there is to know about that topic online. If you are a Hollywood movie buff or interested in following a particular celebrity gossip, create Google Alerts to keep track of the latest events. You can receive emails for different types of online content – News, Blogs, Video, Discussions and Books. While there are many niche websites that cover broad topics like video, news, etc. Google Alerts acts as a intelligent crawler that delivers content you are interested in right to your email inbox. You can set the Google Alerts to update you as it happens, once a day or once a week which prevents flooding your email inbox with plenty of emails. While email is one form of delivery Google Alerts supports, you can also have Google deliver Alerts to your Feed if you use Feed as your “social”newspaper. Learn how to create Google Alerts below and start managing your Google Alerts about the topics that interest you the most. 1. Go to Google Alerts – the dashboard lists various filters you can use to create a search query and get notified when they show up in various forms in the web. 2.Start with a topic that interests you (we picked apple) and customize the Alert to your liking. You can set Result type, How Often, How many, and Delivery form. Be sure to filter the Result Type so as to not flood your inbox with all types of online content. News is always a popular Result type to pick especially if you are following a developing story. 3. Check out the real-time preview of what your Google Alert is picking up. The email that will be delivered to you will be in this form. Once you are done customizing the Alert, click Create Alert. 4. 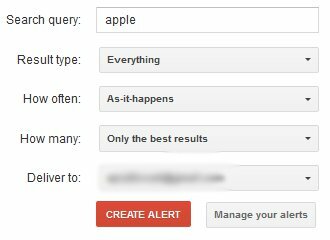 Once you create Alert, you will be taken to the dashboard to manage Google Alerts. 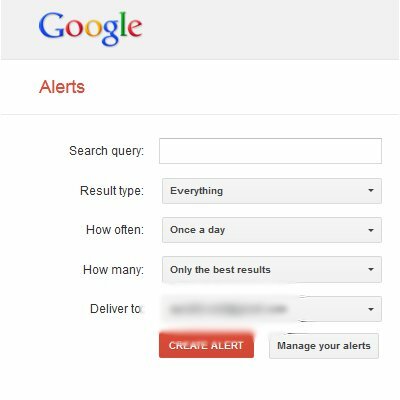 You can create multiple Google Alerts and if you want to delete any Google alerts in the future you can go straight to the Google Alerts Dashboard. How many Google Alerts did you create? Do you think this is a great feature to keep tabs on current topics. 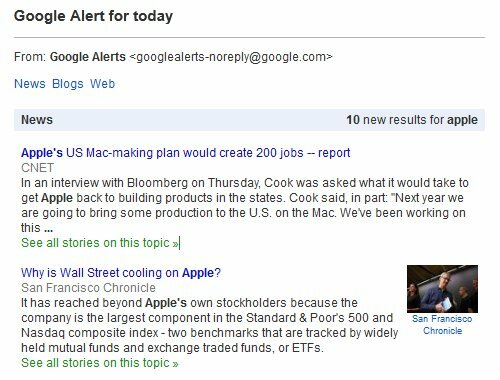 Create Google Alerts and share your Google Alerts with our readers below.